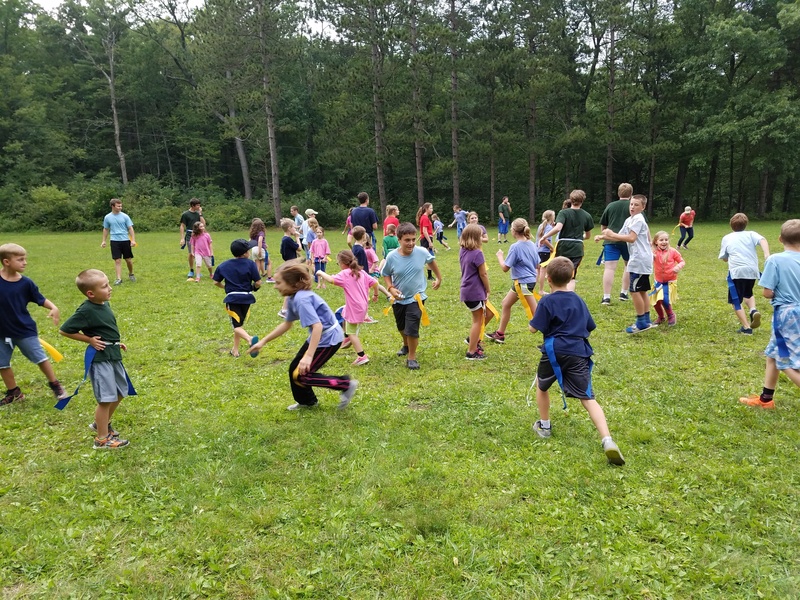 In mid-August, 63 campers, along with 81 staff, parents and grandparents, joined together for three days of fun, fellowship and faith in the mountains of Pennsylvania. Campers playing a game at preteen camp Seven Muontains. The story of Elijah was our theme, and everyone from babies to preteens learned about the miracles and wonders God worked through him and his faith. As was fitting for the camp theme, the anticipated rain held off for all three days of camp (thankfully not three years!). God blessed our time with bright, cool days, and the rain poured soon after we left. Campers’ days were filled with using power tools to craft step stools for each camper, making brilliantly colored tie-dye shirts, playing all kinds of sports, massive splash battles while boating and playing minute-to-win-it games by firelight. We also managed to squeeze in team building and swimming, archery and a tough hike for the oldest dorms. The hike was a lesson in perseverance, and they were well rewarded with a beautiful view. Our youngest campers enjoyed a special grandma camp in the mornings with Bible lessons, activities, songs and games just for them. And what fun would camp be without our annual, camp-wide, capture-the-flag game on the last night? That evening, after the game, the campers’ voices softly rang out over the campfire and across the lake, singing a beautiful song of worship together. This is what kids camp is about, and what we work for and look forward to all year. Thank you so much to our hardworking and wonderful counselors and staff who made this year the best yet. We could not have done this without you and we can’t wait to see you again next year!